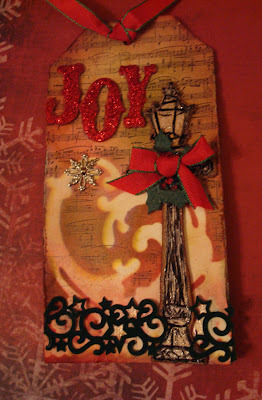 Here's my version of Tim Holtz's 12 Days of Christmas - Day 3. 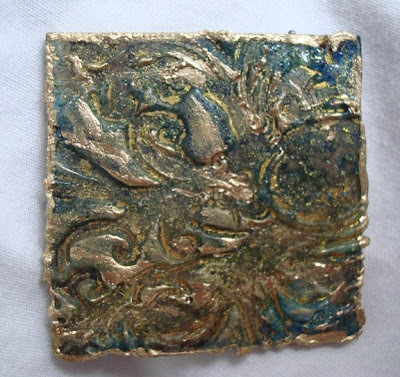 I didn't have the right size fragment so I substituted a diecut piece of acrylic and edged it with a gold Krylon pen. However, I started edging it while the glossy accents was still went so it was getting my Krylon pen all gummy so I started scraping the pen against the edge of the acrylic and it made it look more like a frame. I like it! Except for the "Believe" tag, the charms are from ACharmingPlace.com. I love layering that swirl charm! It’s a busy, busy week prepping for two classes this week, Raquel’s birthday, a Christmas party, a birthday crop, and at some point this week, we need to get a Christmas tree! It sure doesn’t sound like there’s much time to do any playing in the craft room with so much on the "to do" list. 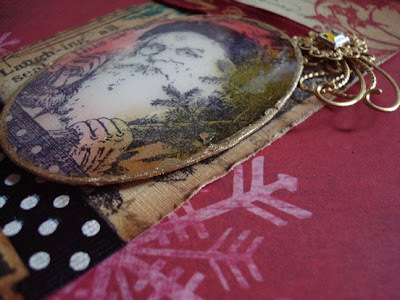 But just watching Tim Holtz’s blog, makes you want to create! My friend, Leah, was feeling the same way and suggested that we have a "schedule" to get it all done. She has a busy schedule too because her family Christmas party is this weekend. So, even though she’s on the East Coast and I’m on the West Coast, we have decided to take an hour (or two) a day to coordinate some crafting together via Skype. Today was our first day, and with both of us so busy, it was hard to coordinate being ready at the same time, not to mention the time difference, but we finally played around 10:30ish this morning. We had so much fun making our version of Tim’s Day 1 tag. About an hour or so after we logged off Skype, Leah texted me that she had fun and can’t wait until tomorrow. I texted her back and said let’s not wait! Let’s do it again later today! So, we did and here is my version of Tim’s Day 2 tag. By the way, in addition to crafting today, I got lots of things checked off my "to do" list too. When Jose came home, he even said "Wow, the house is clean!" I can hardly wait to play again tomorrow! Last night, I was thinking I would add some snow to a page in my Christmas album but I couldn't remember the exact recipe. I know I saved it somewhere, but didn't want to spend the time to look for it, so instead I thought I would go from memory. Then I remembered that I didn't have one of the ingredients (white UTEE). So, I thought, hmmm...I wonder if I could make something that resembles snow using UTEE and glimmer mists (because those glimmer mists were still sitting on my table from playing the night before). Well, what I made did not look anything like snow unless you count the white flurry of a mess that I created all over my table (and my pants...and the floor...) with the UTEE! However, the mess that remained on the paper was looking pretty awesome even though it didn't look like snow! So, I added some of the other glimmer mist colors that were sitting on my table. I was really liking the results of this big mess (and I know how to contain it next time). The little bit of stuff that stayed on my paper had so much texture and depth and color, I thought that it would make a great ATC background since it was just the right size. But the problem was that the background was so pretty that I didn't want to cover it with anything. Aha! 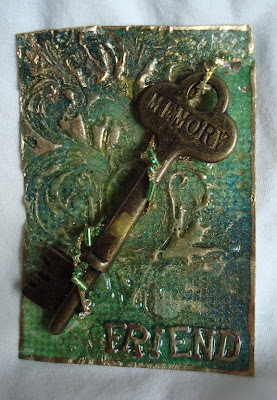 I'll put one of Tim Holtz's keys on it! and when I did, well, it just screamed "Leah" ! AND, I happen to owe Leah an ATC (and she's probably one of the few people I know that I would actually be willing to give this up to!) So Leah, here is your ATC, I hope you like it. If you'd rather have something different, just let me know because Kathryn thinks I should keep this one! So here it is, my nonsnow glimmer mist mess (along with more experimenting on a Bazzill chip. 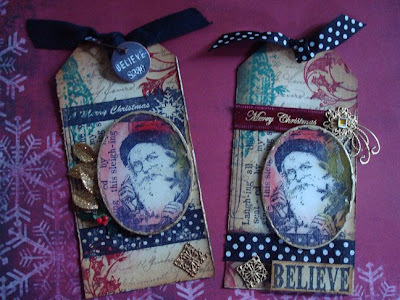 Oh, and before I went to bed last night (past midnight of course), I checked Tim Holtz's blog to see what his new tag of the day would be, and guess what was on there? His snow recipe! Wow, it looks like I was in Portland for a long time - like two months! But no, it's just been a while since I've updated my blog. Portland was certainly fun. I need to get busy soldering stuff before I forget how. 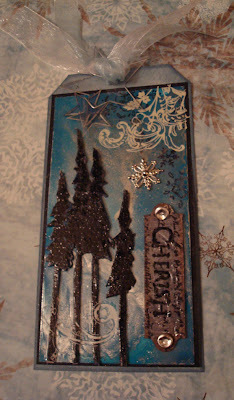 Today, I played with Glimmer Mists, their stencils, and of course charms from ACharmingPlace.com. I sprayed the tags with two colors of Glimmer Mist, put down the stencil and sprayed with a third color, heat set it and then stamped the tag with a script stamp. The flowers are made from coffee filters that I sprayed with two colors of Glimmer Mist, heat set, scrunched and then folded the coffee filter in half, and then in half again and tore out the center. I was left with an "O" and then tore the "O" in half and made two flowers out of it (the two tags on the right). The tag on the left, I tore a little less out of the center of the coffee filter, so the flower is larger. The flower centers are glue dots covered with german glass glitter. 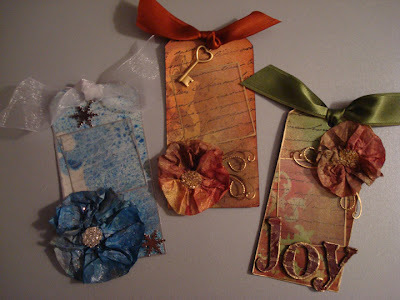 For the "Joy" tag, I sprayed glimmer mist on the chipboard letters, heat set, and then embossed them with clear embossing powder. While the embossing powder was still warm, I stamped into it with a script stamp inked with gold ink, and edged them with a gold Krylon pen. The frames are transparencies that I edged with a gold Krylon pen, and added my favorite swirl charms. It was fun! I'm going to work on a glimmer mist book cover next. Hopefully, it won't be another two months before I post again!